Custom orders are welcome. If you have a vision, we can work together to make something that you'll love. Below are a few examples of custom orders from over the years. Send me an email or fill out the contact form to get started! Sterling silver and turquoise ring. 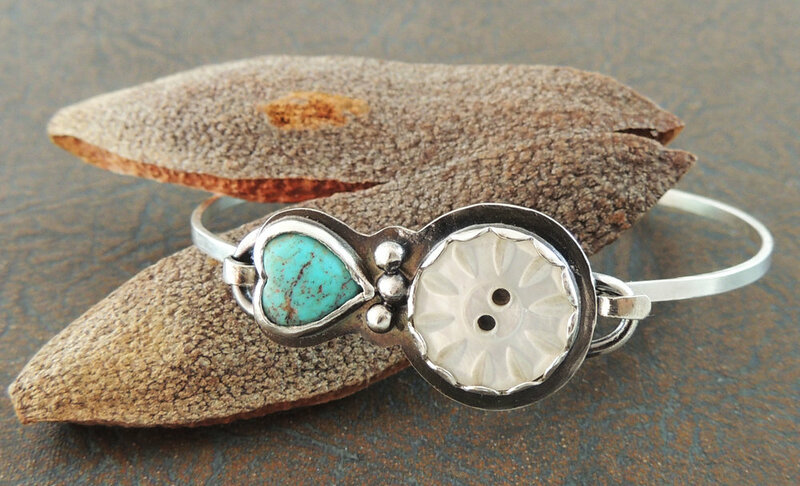 Sterling silver, turquoise heart and antique mother-of-pearl button bangle. Sterling silver and green jasper pendant. Brass bats with oxidized silver chain necklace. Star Wars inspired cosplay silhouette pendant in sterling silver. Sterling silver and faceted lapis lazuli Pendant. Large beaded necklace. Mixed metals (copper, brass, bronze, sterling silver), brecciated jasper, carnelian, bone, horn, ocean jasper, tiger's eye, dzi agate, red jasper, chinese writing stone, wood, sustone, black agate, cross stone and orange aventurine. Sterling silver turquoise tab pendant and chain. Sterling silver, hessonite garnet, imperial jasper, copper pierced pendant necklace.